from Atlas of Madison County, New York : from actual surveys / by and under the direction of D. G. Beers. 194-195. United States of America. The World Atlas. from County atlas of Cayuga, New York. From recent and actual surveys and records under the superintendence of F. W. Beers. from Atlas of Wayne County, New York : from actual surveys and official records / compiled & published by D. G. Beers & Co.
Composite: Vereinigte Staaten v. Nordamerika. from Atlas of Schuyler County, New York : from actual surveys by and under the direction of Beach Nichols. Vereinigten Staaten von N. America. from Atlas of Steuben County, New York : from actual surveys and official records / compiled & published by D.G. Beers & Co.
from Atlas of Franklin County, New York. : From actual surveys and official records. 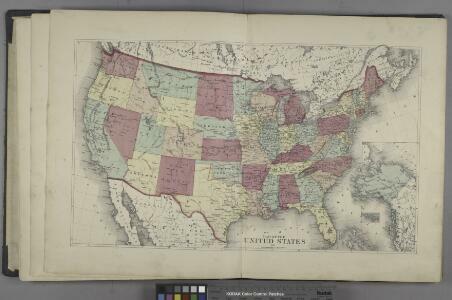 1 : 7285000 Andriveau-Goujon, E.
Map Of The United States, British & Central America. North America from the most authentic and latest surveys. North part of America, 1625. North America drawn from the latest and best authorities / T. Kitchin, del. ; engrav'd by G. Terry. United States with the contiguous British & Spanish Possessions. Composite: United States with the contiguous British & Spanish Possessions. Map of the United States: with the contiguous British & Spanish possessions / compiled from the latest & best authorities by John Melish; engraved by J. Vallance & H.S. Tanner. Description: from Atlas of Madison County, New York : from actual surveys / by and under the direction of D. G. Beers.